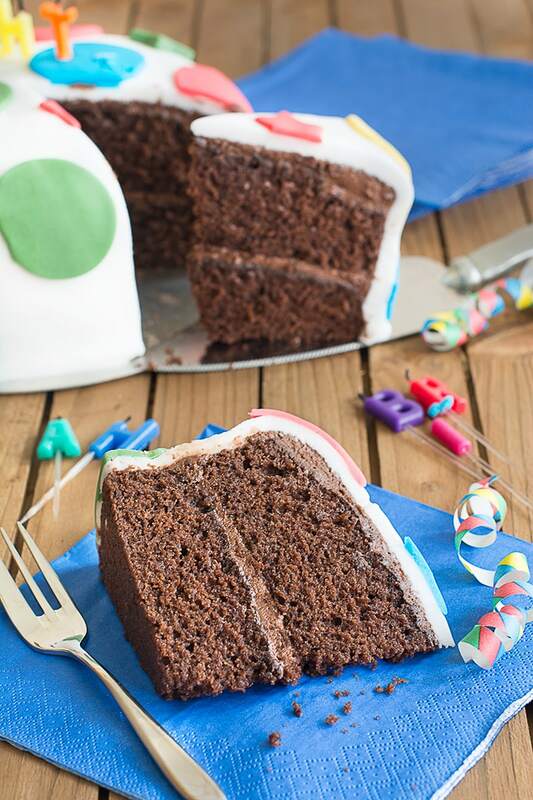 One question I’ve been asked a lot in the past is whether I can recommend a really good chocolate birthday cake recipe, and I couldn’t… until now. I get a lot of comments on my all-in-one vanilla sponge birthday cake and the ones that always makes me smile the most are when people say that they never bake and the simplicity of the recipe has given them the confidence to do more in future. 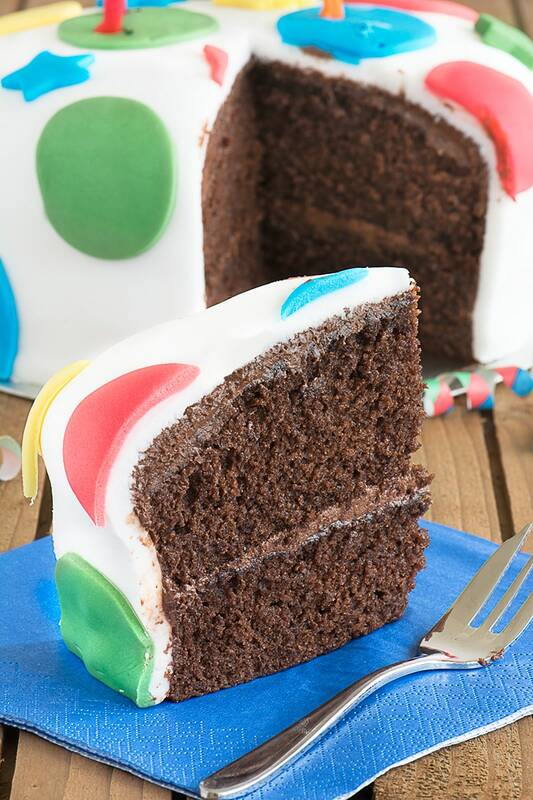 I wanted this chocolate cake to be that simple to make… a cake even the novice-est of cooks can make. 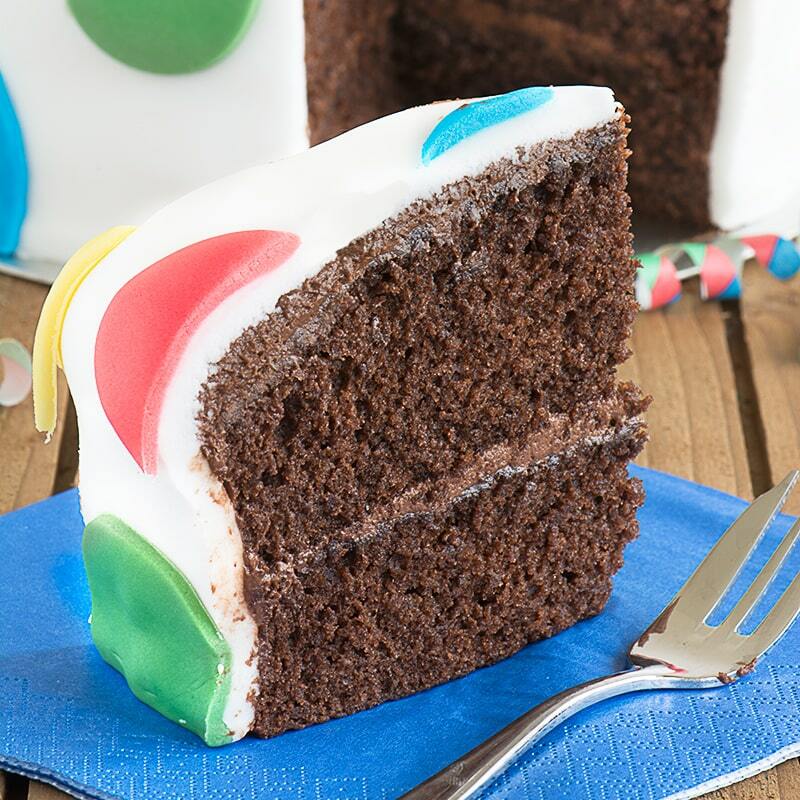 This cake is so simple… chuck it all in and mix it up. The only piece of culinary skill you need is a bit of grating! When I make birthday cakes for my boys I love to go to town on the decoration (you can see some on my cakes in my cake gallery). 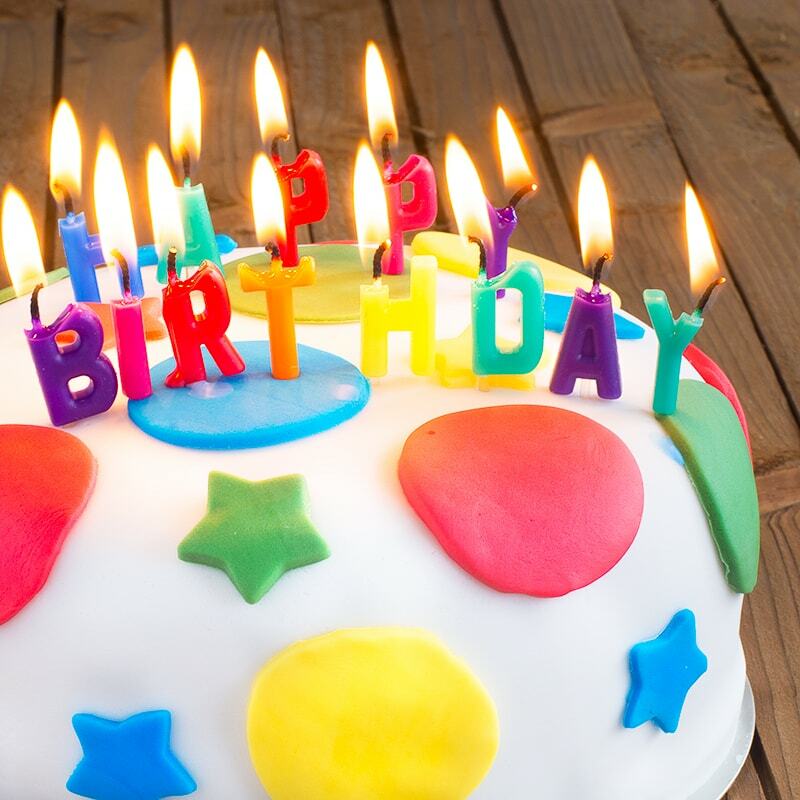 In order for the cake to work as a decorated cake it can’t dome too much on top or sink in the middle and it must be sturdy enough to be carved into various shapes for decorating without crumbling. This is actually the big reason I’ve not been able to recommend chocolate cake recipes until now. All the cakes I’d made in the past with the right texture (see point 2) used just cocoa powder and they simply weren’t chocolatey enough. To give this cake some extra chocolate-iness it includes lots of actual chocolate grated into the cake mix alongside the cocoa powder. 100 g milk chocolate - choose something from the baking aisle in the supermarket as it will cope well with the heat in the oven without going grainy. Line your tins (2x 20cm sandwich tins) with liners or greaseproof paper. Put all of the ingredients into a large bowl (200g self-raising flour, 40g cocoa powder, 230g caster sugar, 4 large eggs, 230g soft margarine, ¼ tsp vanilla extract, 2 tsp milk and the grated chocolate) mix on a low speed until fully combined. Divide the mixture evenly between the two tins and spread it out so it’s pretty even (it doesn’t have to be perfect as it’ll even out in the oven, but roughly flat is good). After 10 minutes, remove the cakes from their tins and pop them onto a wire rack to cool completely before decorating. If you would like to make this cake in a different size then you can use my chocolate cake calculator to find the ingredients you need. 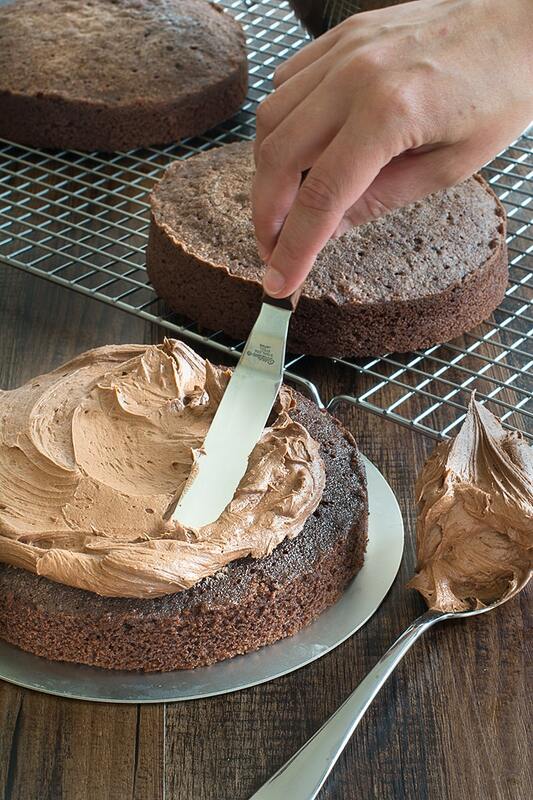 You can find my recipe for the chocolate buttercream to cover the cake here. 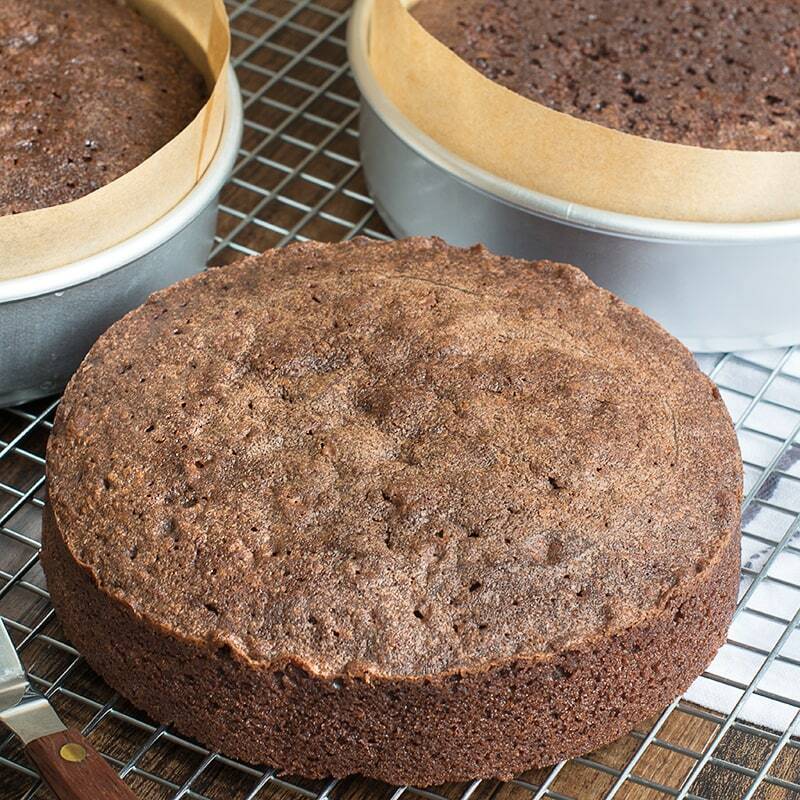 If you want to make this cake in one deep tin rather than two sandwich tins then the cooking time will need to be increased to 45-50 minutes. Nope. I originally tested it with baking powder and I found it rose too much in the oven and then collapsed when I removed it. The raising agents included in the self-raising flour should be fine to give the cake enough lift. I tried out your recipe as I was searching for a good chocolate cake that goes well with fondant and I think I’ve finally found the one! This cake was so delicious, super moist and soft and spongy but at the same time dense and rich. The grated chocolate (only tedious part!) added depth and richness and went well with my SMBC filling. I used your calculator to make 2 7” x 3” rounds which I split and layered up. I made this 2 weeks in advance and froze it and it turned out fine. I also added some sugar syrup on each layer to help keep the cakes moist while decorating. Overall, really happy with this and will defo be my go-to recipe from now on. I am only just thinking to grate the chocolate in a food processor beforehand so I have it ready when baking. If you really hate the grating then you can melt the chocolate instead (set it aside to cool before adding it to the cake mixture). I find that you get little bursts of chocolate-iness when you grate whereas the cake has a more even chocolate flavour with melted, but both taste good.